I was first introduced to Kallistos Ware’s book The Orthodox Way on September 2, 2006 when it was given to me after a chance meeting with an Eastern Orthodox priest. This priest, whose name I do not know, gave me five books about the Eastern Orthodox Church after briefly taking to me in a hotel restaurant in Los Angeles. 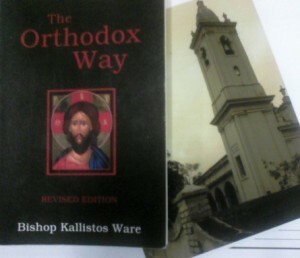 Of the five books the priest gave me, Ware’s The Orthodox Way stood out because of its spiritual depth and simple prose. Twelve years later I can honestly say that this book changed the course of my life by introducing me to the path of the mystic. Though each of these chapters are packed with amazing gems, the first chapter, “God as Mystery,” was the one that had the most lasting impact on my life. The overall gist of this chapter is that God cannot be known strictly by intellectual reason or as the “conclusion to a process of reasoning.” Rather, knowing God means knowing him as a person who loves and cares for us. Faith in God is, after all, “not logical certainty but a personal relationship” that embraces the presence of doubt while still embarking on the journey. Another gem within Ware’s book is his liberal use of quotes from the Church Fathers and Orthodox service books. Most of these quotes were placed before and after each chapter, though he does sprinkle them throughout the body of the chapters. It was through reading these quotes that I was introduced to the Desert Fathers, although it would be years later before I fully realized the spiritual wisdom of these passionate followers of Jesus. Kallistos Ware, The Orthodox Way (Crestwood, New York: St. Vladimir’s Seminary Press, 1995), 9. Kallistos Ware, The Orthodox Way, 9. Kallistos Ware, The Orthodox Way, 5. Kallistos Ware, The Orthodox Way, 16. Joshua S. Hopping, “Embracing The Mystery Of God”, Wild Goose Chase (blog), September 24, 2010, accessed February 19, 2018. Gregory of Nyssa, Commentary on the Song of Songs, quoted in Kallistos Ware, The Orthodox Way, 14. Kallistos Ware, The Orthodox Way, 10. Joshua S. Hopping, “Simplicity and Self-Sacrifice: Lessons from the Desert Fathers” (final paper, St. Stephen’s University, 2016), Wild Goose Chase (blog), released in three parts on November 9th, 11th, & 13th, 2016, accessed February 19, 2018. Joshua S. Hopping, “Embracing The Mystery Of God”, Wild Goose Chase (blog).